A lock-down defensive effort spearheaded by Beau Ludwick and Noah Krathwohl highlighted Penn’s 64-40 victory against Glenn on Thursday, Jan. 11. The Kingsmen handed Glenn its first loss in Northern Indiana Conference competition. Penn improved to 7-2 overall and 4-1 in the NIC. Glenn is 8-3 overall and 5-1 in the NIC. 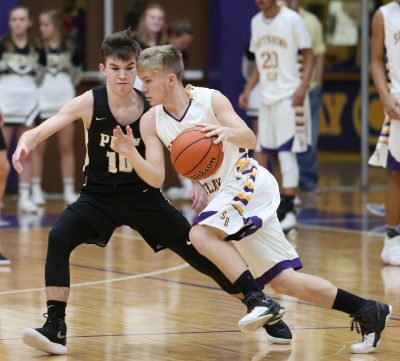 “Excellent defensive work by the Kingsmen was the key to an important NIC win,” Penn Head Coach Al Rhodes said. “Led by Beau Ludwick and Noah Krathwohl on Glenn’s top two scorers, the Kingsmen held Glenn to four points in the second quarter. “Kegan Hoskins and Noah Applegate led a strong rebounding effort that triggered the Kingsmen fastbreak offense,” Rhodes continued. “This was an excellent team effort! Penn High School All-State Candidate Noah Applegate, a 6-foot-6 Junior wing, pumped in 21 points and soared for eight rebounds. Kegan Hoskins muscled inside for nine points and 11 rebounds. Drew Lutz scored 11 points and passed for eight assists. Noah Krathwohl scored eight points. PENN 64: Carter Hickey 4, Drew Lutz 11, Drew Schneider 4, Beau Ludwick 4, Luke Carlton 3, Noah Applegate 21, Noah Krathwohl 8, Kegan Hoskins 9, Cameron Koschnick 0, Jeffrey Hemmelgarn 0. Glenn 40: Jake Morris 3, Robby Porter 8, Zac Mago 16, Collin Barker 0, Aaron Wright 0, Nick Frankiewicz 0, Gabe Weiss 0, Mike Machnic 2, Khori Barker 0, Nate Yung 4, Carter Yung 2, Evan Dreibelbeis 5. Three-pointers: PENN 5 (Noah Applegate 2, Drew Lutz 2, Luke Carlton 1), Glenn 7 (Mago 4, Porter 2, Morris 1).